What are ticket prices? The 2019 ticket prices ranged from $68 - $85 per ticket (prices subject to additional processing fee and handling charge). All guests will enjoy a hot lunch before being escorted into the main auditorium for the roundtable discussion. For ticket information contact Ticket Manager Kim Miller at kimm@cantonchamber.org or 330.458.2048. What should I wear? Some guests will be wearing business/casual attire, but this is definitely a casual event for fans to enjoy. Feel free to wear the jersey of your favorite football team! Where do I park? NEW IN 2018: A pre-purchased parking permit is required for the on-site parking deck. Some patrons choose to find on-street parking or at surface lots, but a pre-purchased parking permit is strongly encouraged. What time should I arrive? We encourage all guests to allow extra time forthe parking and security scretting. In 2018, the parking deck opened at 10:30, doors opened at noon, and lunch was served at 12:15 p.m. Members of the current Class of Enshrinees will briefly tour each of the dining areas just before lunch is served. What happens during the roundtable? Members of the new class will be seated center stage, and a sportscaster of national acclaim will lead them in an unscripted, informal chat about their playing days and special moments during their careers. You never know what to expect, but it's always insightful, emotional, and humorous -- truly a fan favorite! What time does the event conclude? The event should conclude around 2:45 p.m. 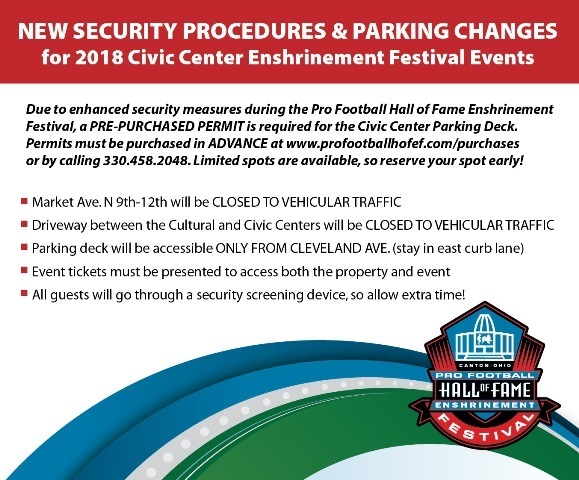 THE 2018 SECURITY PROCEDURE & PARKING CHANGES WILL STAY THE SAME FOR THE 2019 EVETNS. PLEASE PLAN YOUR TRIP ACCORDINGLY.